TORONTO (July 18) — It is rather puzzling that people who observe the Leafs for a living, and those that root for the club with their entire soul, have lost appreciation for veterans Tyler Bozak and James van Riemsdyk. Particularly when both are coming off their most effective seasons in Blue and White. In my view, the reason is two–fold: a) fans and media were “blinded” by the accomplishments of the Big 3 draft phenoms — William Nylander, Mitch Marner and Auston Matthews — to such a degree that all other contributions were overlooked. And, b) most seem to contend that the Leafs cannot afford to move beyond next season with the two vets. Strictly from a salary–cap perspective, there is merit to the latter argument. The players will combine for a cap–hit of $8.45 million in 2017–18, which is a pittance given that Bozak has evolved into one of the most–effective face–off men in the National Hockey League (along with his 55 points in 78 games a year ago) and that JVR finished third (behind Matthews and Nazem Kadri) with 29 goals, while providing virtually the club’s entire offense from the left side. Both can become unrestricted free agents next summer. And, if they perform well again, each will command raises. With Nylander coming off entry–level restriction after next season; Marner and Matthews following in the summer of 2019, the Leafs will indeed have to go cheaper elsewhere. That could necessitate trading one or both of Bozak and JVR in the interim. Among the biggest challenges in the salary–cap era, however, is to avoid a dramatic recession between front–line and support players. Chicago general manager Stan Bowman pioneered such roster juggling and was able to win three Stanley Cup titles between 2010 and 2015. When the Hawks were unexpectedly annihilated by Nashville in the opening round of the playoffs this spring, Bowman made what appeared to be an astonishing trade — sending prolific shooter Artemi Panarin to Columbus for ex–Chicago forward Brandon Saad. Panarin is among the most–gifted young players in the world; winner of the Calder Trophy two seasons back. Can you imagine the Maple Leafs trading this year’s Calder recipient, Matthews? Evidently, Bowman felt (or was talked into feeling by Jonathan Toews and Co.) that his club had become top–heavy; its supporting contingent lacking in both ability and character. Thus, the re–claiming of the immensely–popular Saad, with whom the Blackhawks won two of their NHL championships. This is what the Leafs (and many of their tunnel–visioned fans) risk losing if they undervalue such players as Bozak and van Riemsdyk. Even if, by some miracle, the club is able to move beyond 2019 with all of Nylander, Marner and Matthews, the Leafs will not win the Stanley Cup if there’s too large a gap between first and fourth–line players. Given the club still must somehow acquire an elite, Norris Trophy–type for the blue line — and will be paying 41–year–old Patrick Marleau a guaranteed $6.25 million in the 2019–20 season — dealing one of the Big 3 draft gems is almost unavoidable. Yes, virulent Leaf fans like to play with numbers and delude themselves that the club can afford any and everything, with Long Term Injured Reserve (LITR) salaries coming off the books. 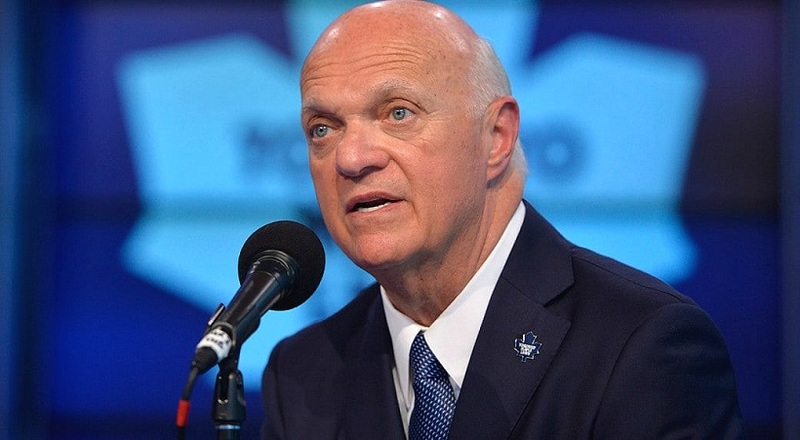 Or that Lou Lamoriello is a born–wizard of the cap era. 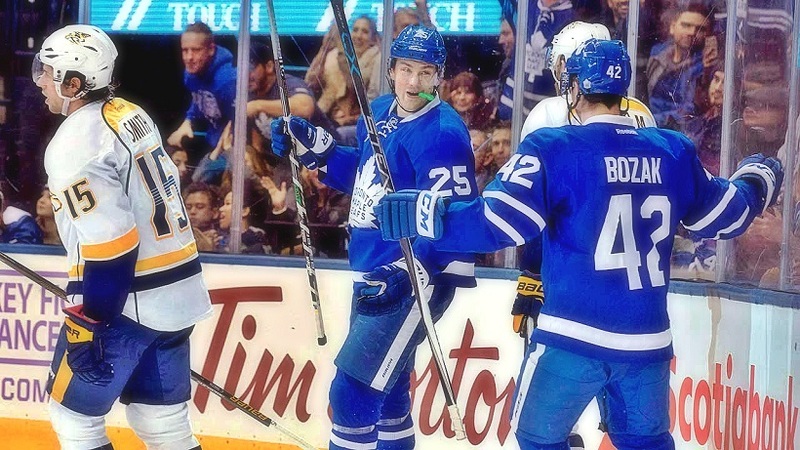 LOU LAMORIELLO MUST DECIDE ON THE BEST OPTION REGARDING FORWARDS TYLER BOZAK AND JAMES van RIEMSDYK. This isn’t to demean Lamoriello — a Hall of Fame person and hockey executive. He has better help around him with the Leafs than he did in his mostly lean tenure at New Jersey, post–2005. But, he is nonetheless bound by the salary–cap figure, which has been stagnant for the past three years. Moreover, Bozak, van Riemsdyk and Marner was the Maple Leafs’ steadiest forward unit during much of last season. Removing two–thirds of the line will not contribute to further ascent in the standings. Trading Bozak and/or JVR will neither bring an Erik Karlsson clone to Toronto nor second–line forwards of commensurate value. It truly ranks among the hockey club’s most–challenging issues. Dan Shulman’s voluntary departure from ESPN Sunday Night Baseball has sparked conjecture that he’ll again become the full–time TV voice of the Toronto Blue Jays. 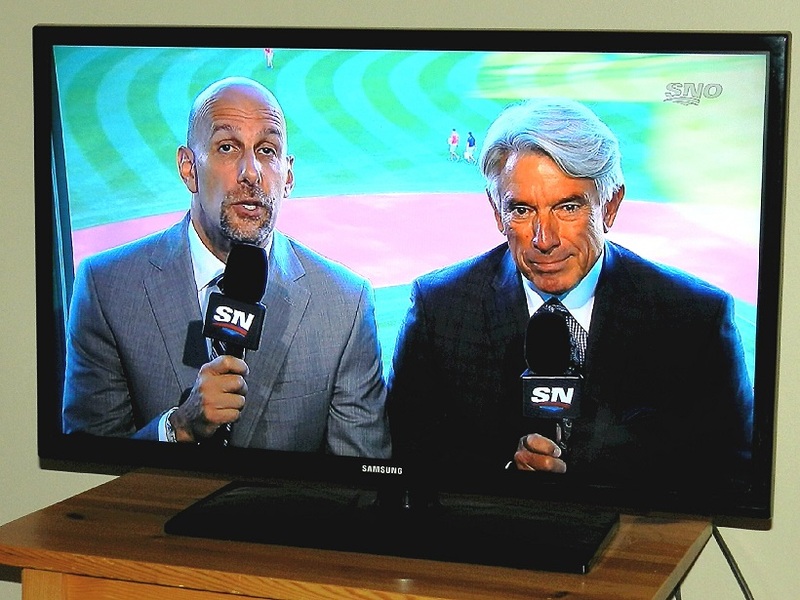 Shulman and former catcher Buck Martinez called Blue Jays games on TSN from 1995 to 2001, whereupon the former moved full time to ESPN. There would appear to be several factors mitigating Shulman’s return to the Toronto baseball role. Among play callers in North America, he has only two peers — veteran sportscasters Joe Buck and Bob Costas. As such, Dan would be an expensive hire. Martinez, in 2010, replaced Jamie Campbell as the Blue Jays TV voice on Sportsnet (the team and network both owned by Rogers; Campbell has since been the pre and post–game host). In September 2014, Buck signed a five–year extension with Rogers to remain in his current position. That contract runs for two seasons after this one. Prior to Martinez coming aboard as No. 1 man in 2010, the Blue Jays would have approached Shulman with a blank check and told him to fill in his number. But, Dan was too entrenched at ESPN to consider such an offer. Instead, Rogers brought him back in a part–time role last season. Dan called roughly 35 Blue Jays games on Sportsnet; the same arrangement applies this year. Shulman, a Toronto native, has re–married a local girl. He stepped away from his Sunday night ESPN role to spend more time at home in the summer. During the winter months, he calls a full compliment of NCAA basketball games in the United States. Were he to take over from Martinez as the Blue Jays play caller, he’d be away from home more frequently than during his years at ESPN, when he typically left on Saturday and returned Monday. Therefore, such a move would come as a surprise. Beyond the obvious — Shulman’s preeminence as a broadcaster and his wonderful on–air chemistry with Martinez — Rogers has not explained why it chose to remove Buck from the No. 1 role for 35 games this year and last. According to the Blue Jays’ parent company, TV ratings have gone through the roof since the club turned the corner at the 2015 non–waiver trade deadline by acquiring Troy Tulowitzki, David Price and Ben Revere. Consecutive appearances in the American League Championship Series have surely inflated the viewing audience. On the surface, you might think Martinez and broadcast partner Pat Tabler would be put off by such a move, yet no one pushed harder than Martinez for Shulman to be hired by TSN in 1995. And, the broadcast is optimum when Shulman calls the play and Martinez provides analysis. Buck and Pat are a likable tandem, but they often over–do the home–team angle. With Shulman in the booth, there’s at least a modicum of neutrality. It will be interesting to see how, or if, this circumstance evolves after the current season. 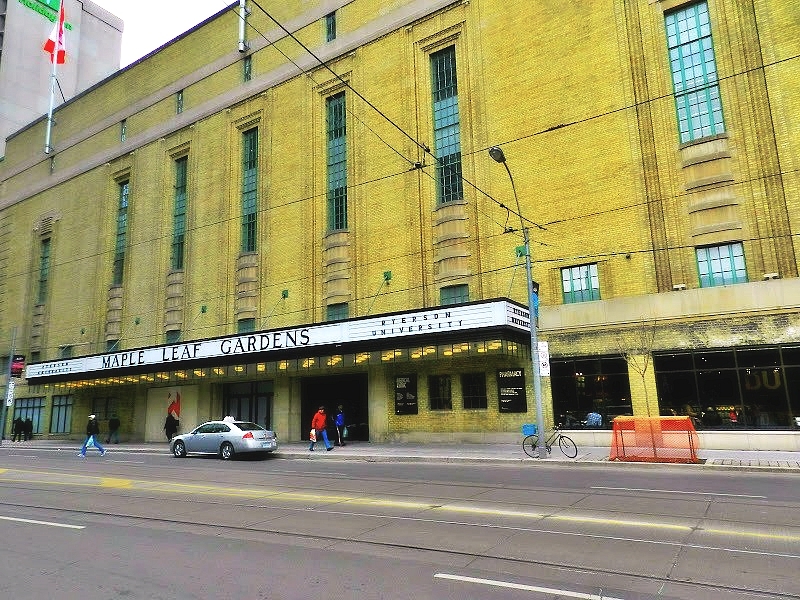 More than 85½ years after opening (Nov. 12, 1931) and nearly 18½ years after its last NHL game (Feb. 13, 1999), Maple Leaf Gardens is the last of the pre–expansion arenas to retain its original exterior. The innards of the building were long–ago eviscerated and converted into sports facilities for Ryerson University. The southeast corner houses a giant Loblaws store, with an innocuous orange dot painted on the floor of an aisle to pin–point the location of center–ice. Four of the other pre–expansion arenas — Boston Garden, Chicago Stadium, Detroit Olympia and old Madison Square Garden (at 8th Ave. and 50th St., closed Feb. 11, 1968) — have long–since been demolished. The Montreal Forum, refurbished for the 1968–69 NHL season (and closed March 1996), looks similar today from the outside (as seen at bottom), but the interior is now an AMC Theaters Multiplex; the building known as the Pepsi Forum. 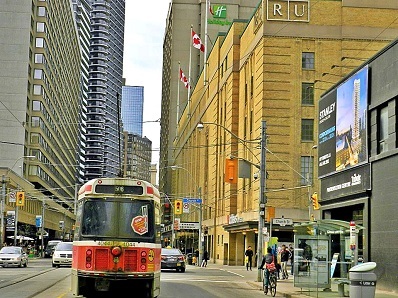 As in the old hockey days, people can still approach Maple Leaf Gardens via streetcar (east or west) along Carlton St. (below–left). 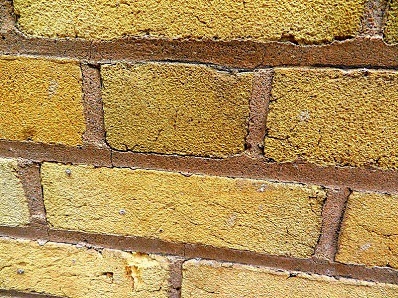 The yellow bricks have been in place since the height of the Great Depression, during which Conn Smythe built the arena. 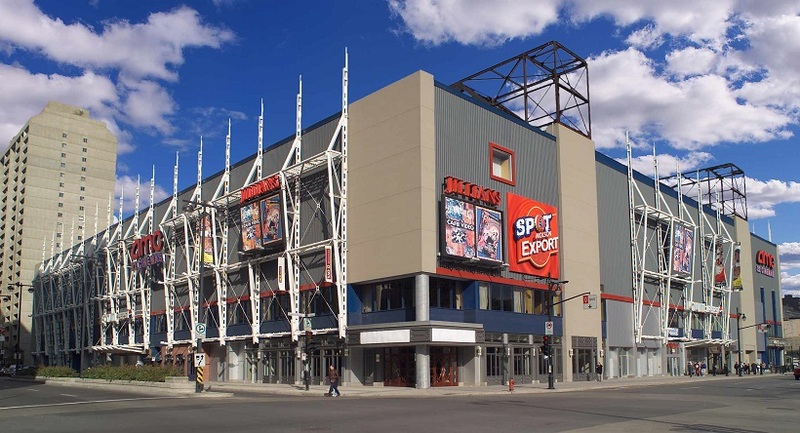 THE PEPSI FORUM IN MONTREAL, AS IT APPEARS TODAY MORE THAN 21 YEARS SINCE THE CANADIENS PLAYED THEIR FINAL HOCKEY GAME AT THE CORNER OF ST. CATHERINE AND ATWATER. • The NHL took in the four surviving teams from its seven–year rival — the World Hockey Association. Coming aboard were the Edmonton Oilers, Hartford Whalers, Quebec Nordiques and Winnipeg Jets. • Wayne Gretzky, 18, began his unparalleled NHL career with Edmonton. • Mark Messier, born eight days before Gretzky in 1961, began his career with the Oilers. • Defenseman Raymond Bourque began his Hall–of–Fame career with the Boston Bruins. 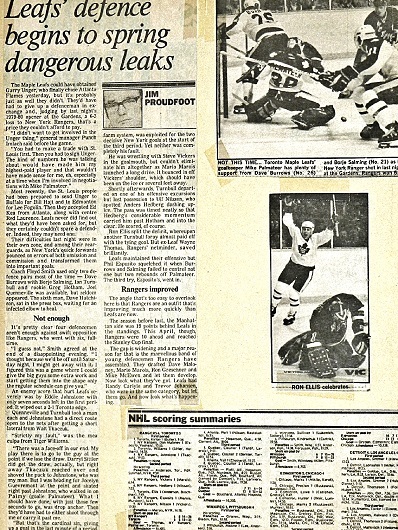 • The WHA merger would ultimately spawn two of the most intense inter–city rivalries in NHL history — Edmonton vs. Calgary and Quebec City vs. Montreal. The provincial Battles of Alberta and Quebec. • Having been fired as general manager of the Buffalo Sabres in December 1978, George (Punch) Imlach returned to the Maple Leafs in the same role. The architect of four Stanley Cup titles in the 1960’s, Imlach’s best–before date had long passed. His re–hiring by owner Harold Ballard crippled the franchise for more than a decade and led to arguably the most tumultuous–ever Leafs season. 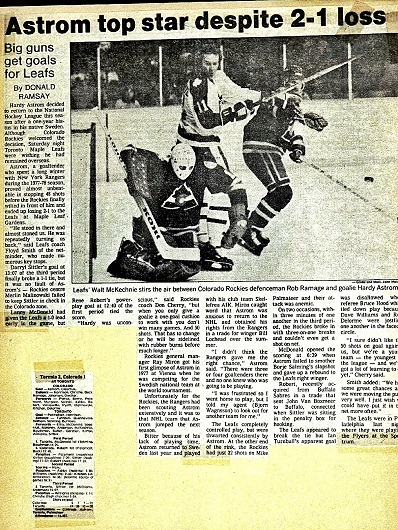 • Imlach, in a calamitous battle with Darryl Sittler, made a destructive trade. He dealt Sittler’s linemate and best friend, Lanny McDonald, to the old Colorado Rockies (Dec. 29, 1979). 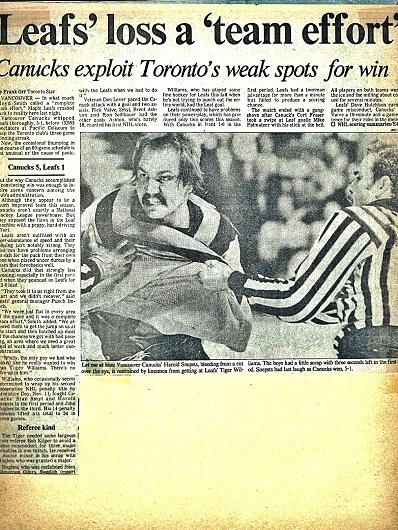 In protest, later that day and prior to a home game against Winnipeg, Sittler had trainer Guy Kinnear remove the captain’s ‘C’ from his jersey. • Having been fired after five seasons as coach in Boston, Don Cherry re–surfaced behind the Rockies bench. • After six productive years in the WHA, Gordie Howe, 52, returned to the NHL for a final season with Hartford. Among his teammates were fellow hockey legends Dave Keon and Bobby Hull. • Under coach Pat Quinn, the Philadelphia Flyers authored an unbeaten streak that may never be equaled. In 35 games between Oct. 14 and Jan. 6, the Flyers won 25 and tied 10. • Having coached Montreal to four consecutive Stanley Cup titles, Scotty Bowman left the Canadiens to become GM of the Buffalo Sabres. 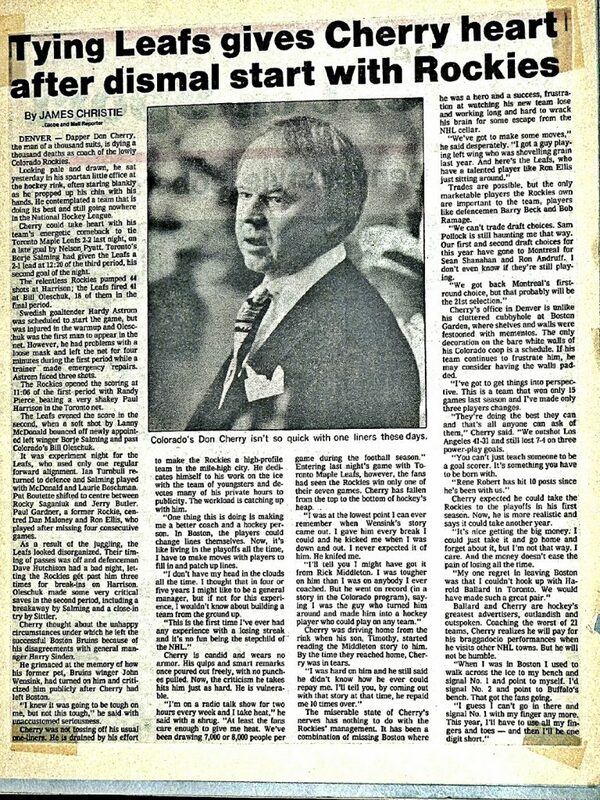 For a coach, he hired Roger Neilson, ex of the Maple Leafs. 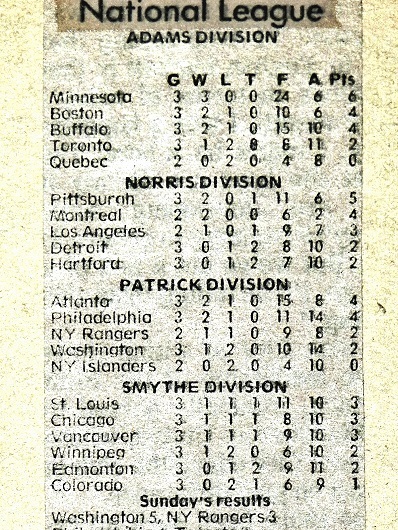 • The Atlanta Flames were in their final season. 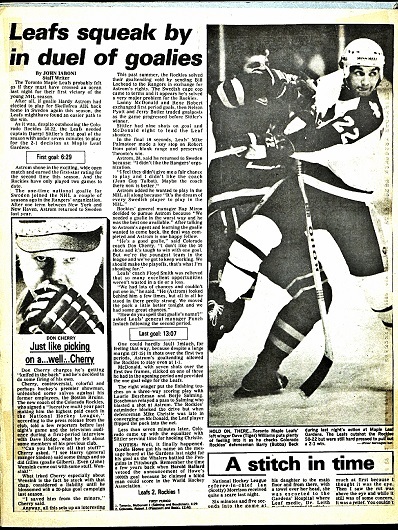 The franchise would move to Calgary for 1980–81. • The New York Islanders, coached by Al Arbour; led by Billy Smith, Denis Potvin, Bryan Trottier and Mike Bossy, became the second expansion team (after Philadelphia) to win the Stanley Cup — beginning a streak of four consecutive NHL championships. No team has since won the Cup three times in a row. NEW YORK RANGERS GOALIE (TODAY, PRESIDENT OF THE COLUMBUS BLUE JACKETS) JOHN DAVIDSON LEANS ON THE BOARDS AT MAPLE LEAF GARDENS PRIOR TO ’79–80 SEASON OPENER. While rummaging through my apartment locker this week, I came upon a scrapbook from the first two–plus weeks of the 1979–80 season. Frankly, I thought nothing of it until I realized the pages contained summaries from the first eight games of Gretzky’s career; from the first Montreal–Quebec match; a photo from Howe’s NHL return, and two Maple Leaf games against Cherry’s Colorado Rockies. In other words, good content. 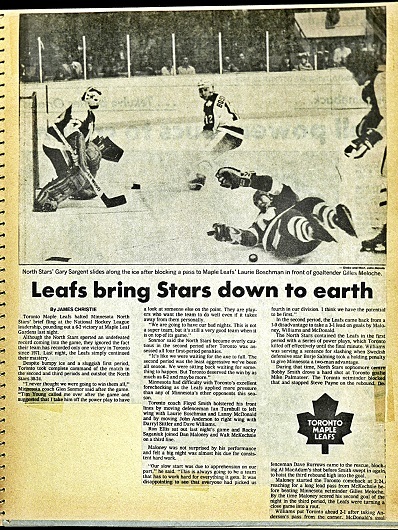 It was still the heyday of hockey coverage, as the three newspapers in this region (Toronto Star, Toronto Sun and Globe and Mail) attended all Leaf games, home and away. Today, the Globe’s sports department is so bereft that it occasionally relies on Canadian Press wire reports from the Air Canada Centre. Legendary scribes Frank Orr, Jim Kernaghan and Jim Proudfoot of the Star; John Iaboni and Rick Fraser of the Sun; Jim Christie and Donald Ramsay of the Globe provided the game stories. Kernaghan, Proudfoot, Fraser and Ramsay have since passed. Photographs were exclusively in black–and–white, and without nearly the resolution of today’s newspaper images. But, the hockey names will jump out at you, even 38 years later. THE LEAFS OPENER WAS A PORTENT OF THE ENTIRE SEASON. 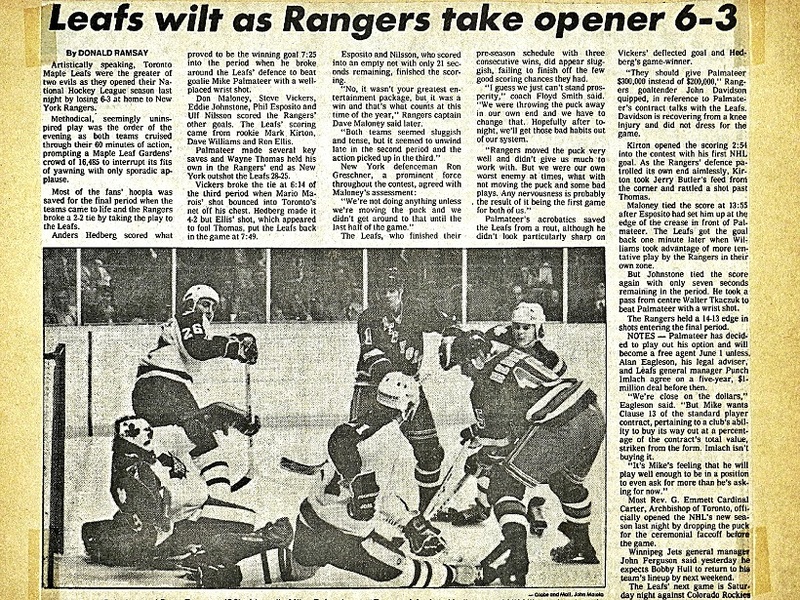 THE RANGERS OUTSCORED TORONTO 4–1 IN THE THIRD PERIOD, SPOILING FLOYD SMITH’S DEBUT BEHIND THE BENCH. 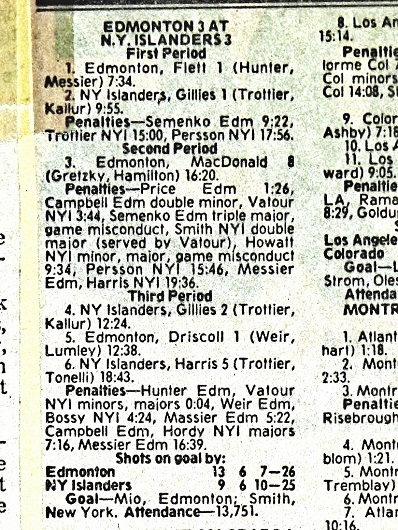 ALSO ON OCT. 10, 1979, THE QUEBEC NORDIQUES, WINNIPEG JETS AND EDMONTON OILERS PLAYED (AND LOST) THEIR FIRST GAMES IN THE NHL. REAL CLOUTIER SCORED QUEBEC’S INITIAL GOAL AGAINST ATLANTA AT THE COLISEE. MORRIS LUKOWICH HAD THE JETS’ FIRST GOAL, AT PITTSBURGH. 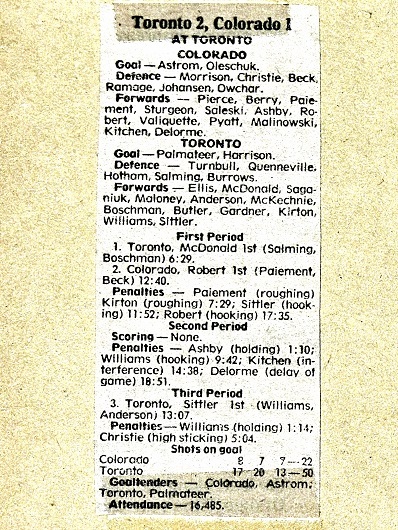 AND, KEVIN LOWE SCORED FIRST FOR THE OILERS AT CHICAGO STADIUM. WAYNE GRETZKY RECORDED AN ASSIST ON THE PLAY — HIS FIRST OF 2,857 CAREER POINTS. 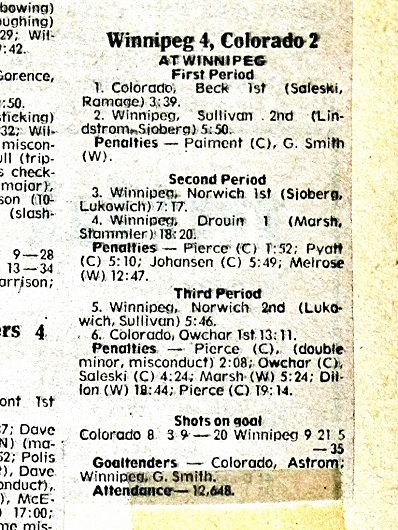 HE ALSO TOOK HIS FIRST NHL PENALTY, A COINCIDENTAL ROUGHING MINOR WITH GREG FOX OF CHICAGO AT 5:19 OF THE OPENING PERIOD. 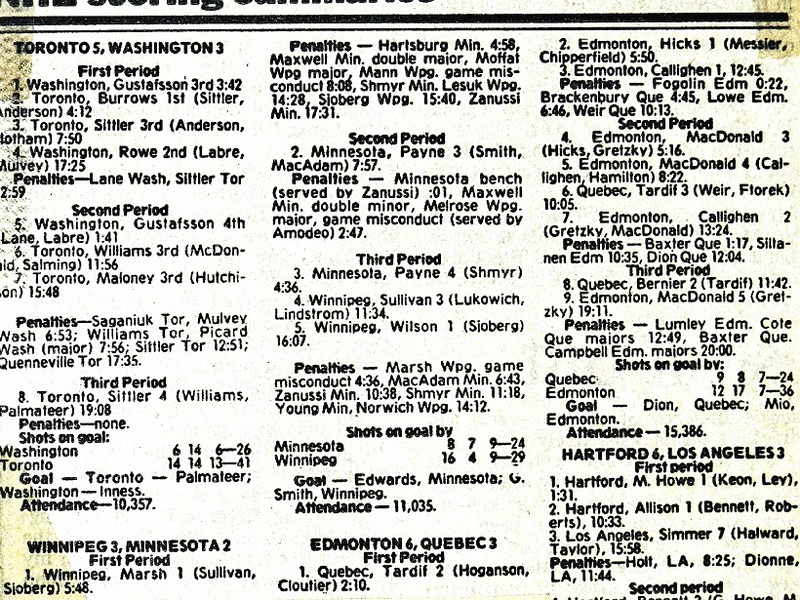 HARTFORD MADE ITS NHL DEBUT THE FOLLOWING NIGHT — OCT. 11, 1979 — AT THE MET CENTER IN BLOOMINGTON, MINNESOTA, LOSING 4–1 TO THE NORTH STARS. GORDIE HOWE (PICTURED ABOVE) WAS HELD OFF THE BOARD IN HIS FIRST NHL GAME SINCE APR. 4, 1971 (WITH DETROIT). DEFENSEMAN GORDIE ROBERTS SCORED THE WHALERS FIRST GOAL WITH 5:45 REMAINING IN MINNESOTA. 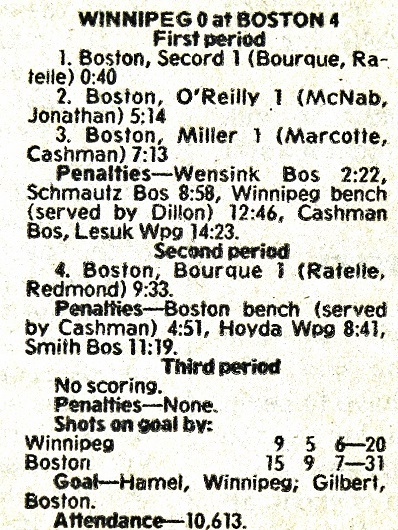 THE SAME NIGHT, AT BOSTON, THE BRUINS BLANKED WINNIPEG IN RAYMOND BOURQUE’S NHL DEBUT. BOURQUE REGISTERED HIS FIRST OF 1,169 CAREER ASSISTS AND 1,579 CAREER POINTS JUST 40 SECONDS AFTER THE OPENING FACE–OFF, SETTING UP A GOAL BY AL SECORD. 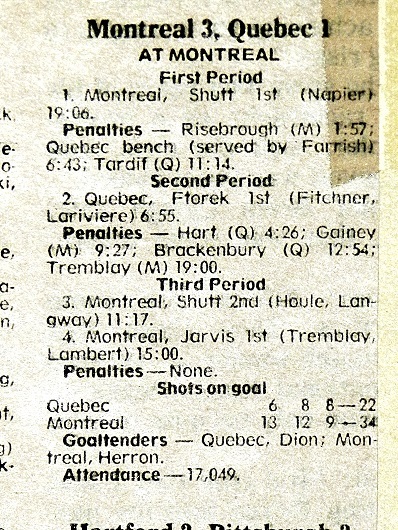 HE THEN SCORED HIS FIRST OF 410 GOALS MIDWAY THROUGH THE SECOND PERIOD. 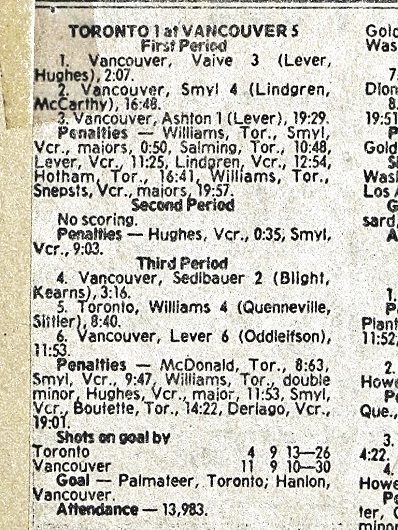 THE LEAFS FIRST WIN OF THE SECOND IMLACH ERA OCCURRED WITH DON CHERRY BEHIND THE VISITOR’S BENCH AT MAPLE LEAF GARDENS. 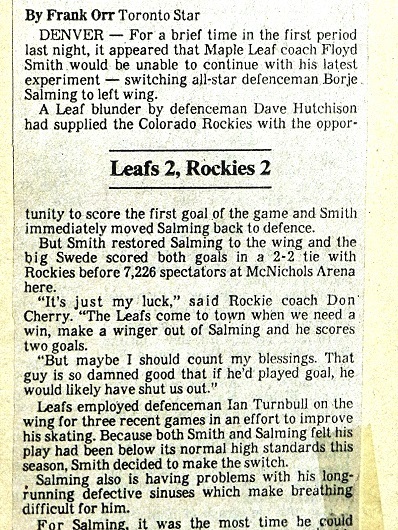 LANNY McDONALD SCORED FOR TORONTO; WILF PAIEMENT ASSISTED ON COLORADO’S ONLY GOAL. McDONALD AND PAIEMENT WOULD BE TRADED FOR ONE ANOTHER AT THE END OF DECEMBER. CHERRY WENT ON TV IN THE FIRST INTERMISSION AND VENTED. AS HE LATER WOULD, ROUTINELY. 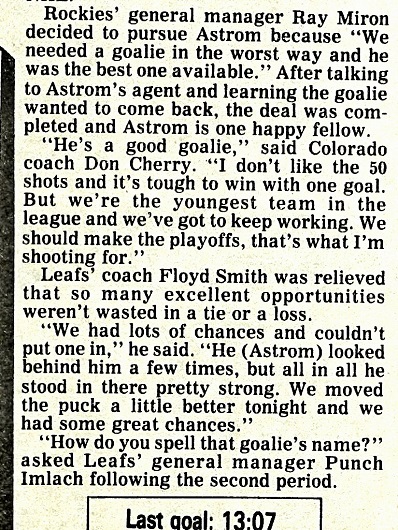 WHAT DELICIOUS IRONY THAT HARDY ASTROM, OF ALL PEOPLE, WOULD NEARLY STEAL A POINT FOR COLORADO IN THAT GAME AT THE GARDENS. 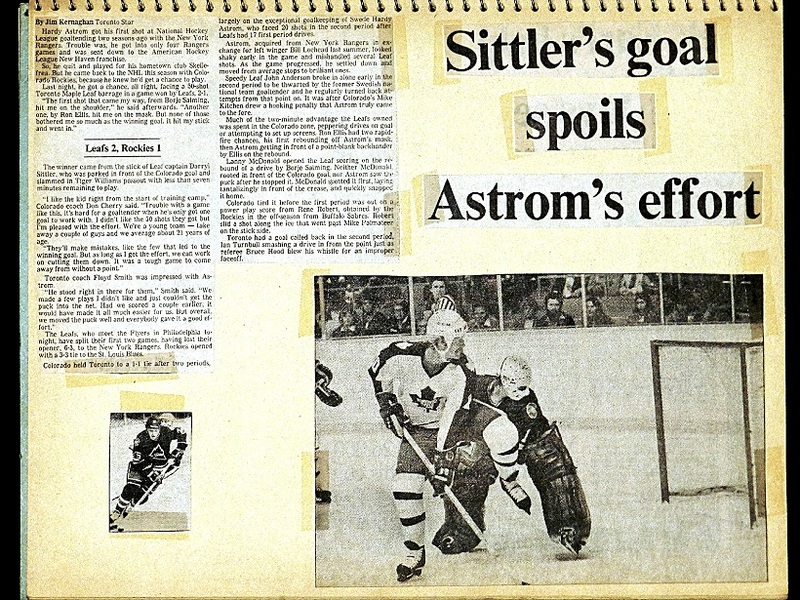 DONALD S. HAS MADE A COTTAGE–INDUSTRY OF PORTRAYING ASTROM AS THE GOALTENDING SIEVE OF ALL TIME. THE ABOVE QUOTES FROM CHERRY MAY BE THE LONE COMPLIMENTS EVER ATTRIBUTED TO HIM ABOUT HIS ROCKIES’ STOPPER. ALSO ON OCT. 13, 1979: THE CANADIENS PREVAILED IN THE FIRST BATTLE OF QUEBEC, AT THE MONTREAL FORUM. ROBBIE FTOREK, WHO WOULD LATER COACH WAYNE GRETZKY IN LOS ANGELES, SCORED FOR THE NORDIQUES. 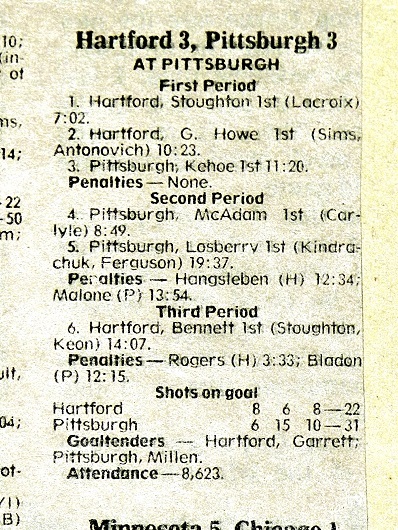 IN PITTSBURGH, GORDIE HOWE NOTCHED HIS FIRST NHL GOAL WITH HARTFORD, AS THE WHALERS AND PENGUINS TIED, 3–3. 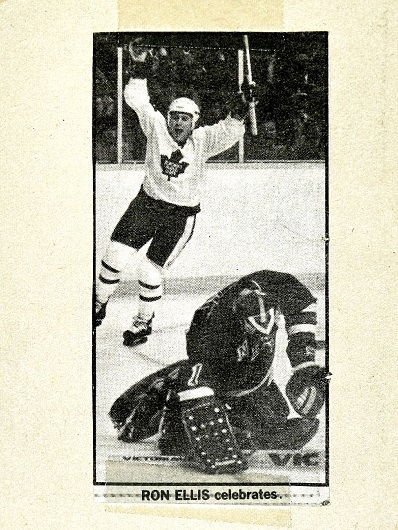 DAVE KEON ALSO RECORDED HIS FIRST POINT SINCE RETURNING TO THE NHL. 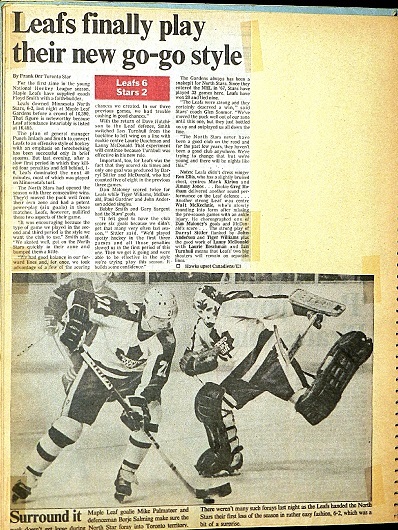 THE GOALIES — JOHN GARRETT AND GREG MILLEN — WOULD LATER EMBARK ON STELLAR TV CAREERS; GARRETT IN VANCOUVER, MILLEN HERE IN TORONTO. SUN. 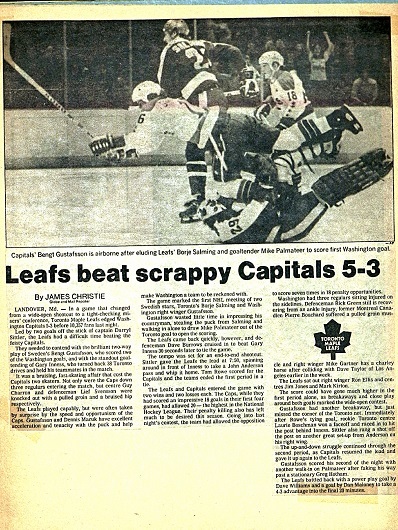 OCT. 14, 1979: THE MAPLE LEAFS WERE EDGED BY THE FLYERS AT THE SPECTRUM. 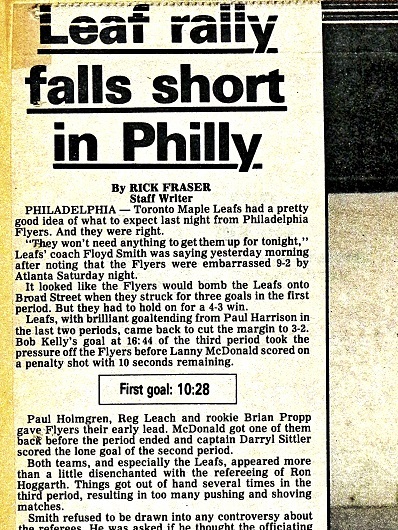 LITTLE DID ANYONE REALIZE THAT PHILADELPHIA — ON THIS NIGHT — WOULD BEGIN A RECORD–RUN OF 35 GAMES WITHOUT A LOSS. 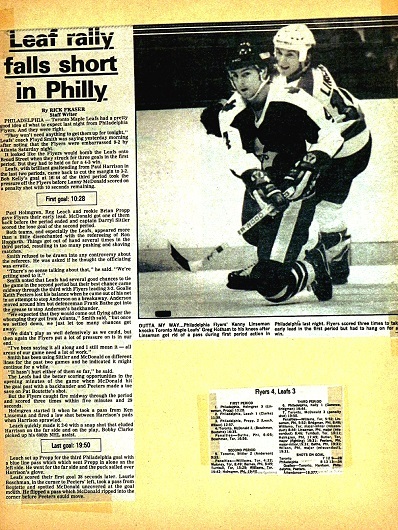 NOT UNTIL JAN. 7, 1980, DURING A 7–1 BEAT–DOWN AT THE MET CENTER IN BLOOMINGTON, WOULD PAT QUINN AND THE FLYERS TASTE DEFEAT. 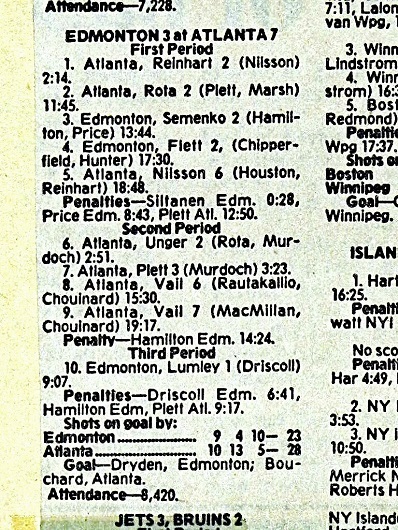 ALSO ON THAT SUNDAY NIGHT, THE JETS — MAKING THEIR NHL HOME–ICE DEBUT AT WINNIPEG ARENA — WON THEIR FIRST GAME, DOUBLING DON CHERRY, HARDY ASTROM AND THE ROCKIES. 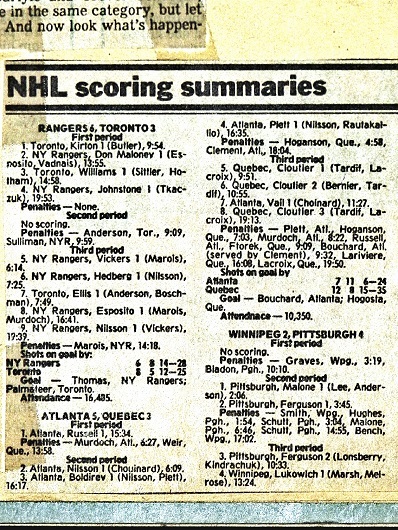 CRAIG NORWICH SCORED TWICE FOR THE JETS AND VETERAN JUDE DROUIN (FORMERLY OF THE NORTH STARS AND ISLANDERS) HAD THE WINNING TALLY AT 18:20 OF THE SECOND PERIOD. MINNESOTA WAS THE LONE UNBEATEN, UN–TIED TEAM AFTER THE FIRST SIX NIGHTS OF THE SEASON. EDMONTON’S WEEKEND NHL SUMMARIES (BOTH GAMES AT NORTHLANDS COLISEUM) WERE HISTORIC. ON SATURDAY, AGAINST DETROIT, MARK MESSIER SCORED HIS FIRST OF 694 CAREER GOALS (AND HIS FIRST OF 1,887 POINTS). THE UNASSISTED MARKER CAME AGAINST FELLOW HALL–OF–FAMER ROGIE VACHON OF THE RED WINGS. 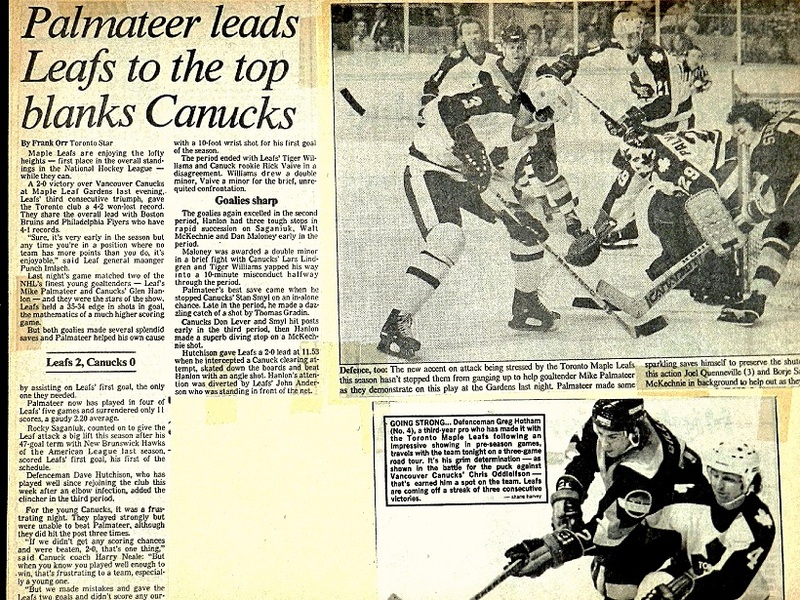 THEN, WITH 1:09 LEFT IN SUNDAY’S DRAW AGAINST VANCOUVER, WAYNE GRETZKY SCORED HIS FIRST OF A RECORD 894 CAREER GOALS. OILER LINEMATES BRETT CALLIGHEN AND BLAIR MacDONALD ASSISTED ON THE PLAY. GOALIE GLEN HANLON WAS THE VICTIM. 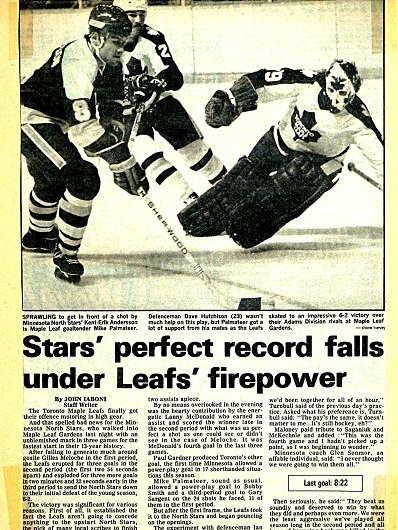 OCT. 17, 1979 (A WEDNESDAY) WAS AMONG THE BRIGHTEST NIGHTS OF AN OTHERWISE MISERABLE SEASON FOR THE MAPLE LEAFS, WHO HANDED MINNESOTA ITS FIRST LOSS OF THE SCHEDULE. 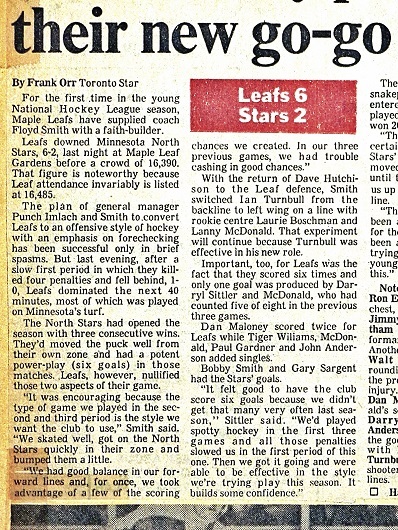 LANNY McDONALD OF THE LEAFS AND BOBBY SMITH OF THE NORTH STARS WERE OFF TO GREAT STARTS — EACH SCORING THEIR FOURTH GOALS IN THE FIRST WEEK OF THE SEASON. 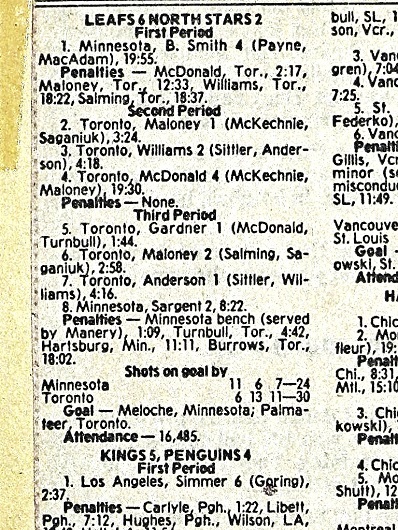 AS YOU CAN ALSO SEE, CHARLIE SIMMER HAD THE FIRST SIX OF HIS 56 GOALS FOR THE LOS ANGELES KINGS. 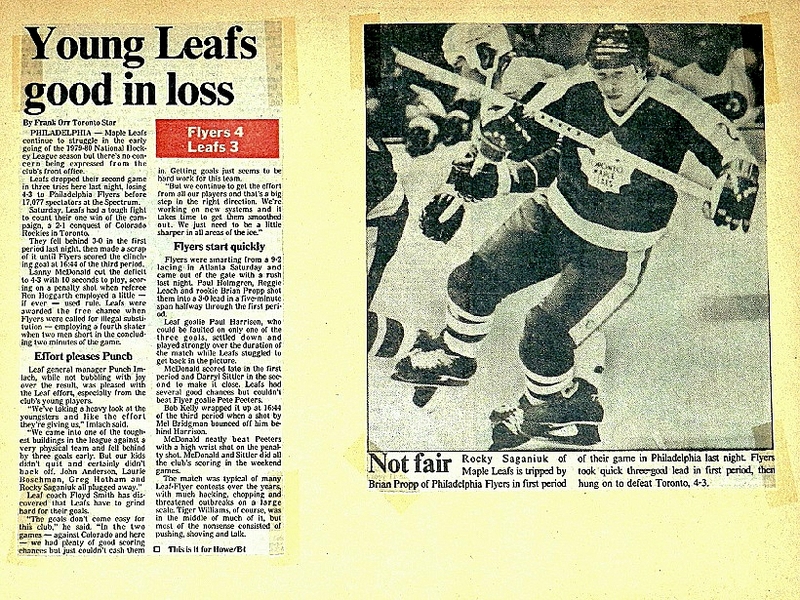 IN THEIR SIXTH NHL SEASON, THE WASHINGTON CAPITALS WERE STILL EASY–PICKINGS, AS EVIDENCED BY THEIR HOME–ICE LOSS TO THE MAPLE LEAFS ON OCT. 19, 1979. 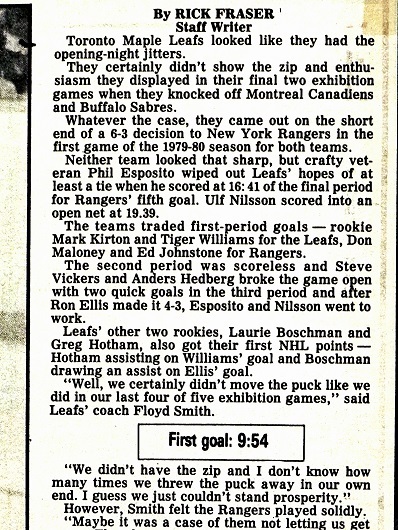 OCT. 19, 1979 WAS ALSO A BIG NIGHT FOR THE EX–WHA TEAMS, WHICH WON THREE GAMES. 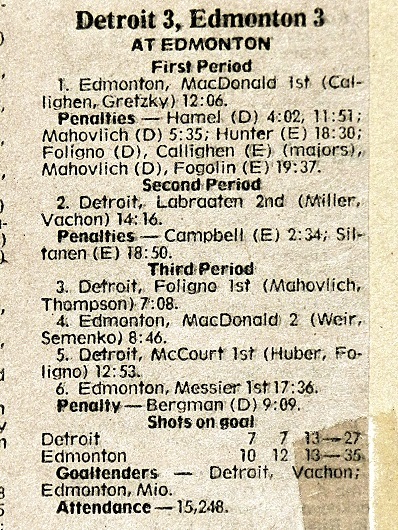 WAYNE GRETZKY HAD THREE ASSISTS FOR THE OILERS, AT HOME TO QUEBEC, IN EDMONTON’S FIRST NHL VICTORY. 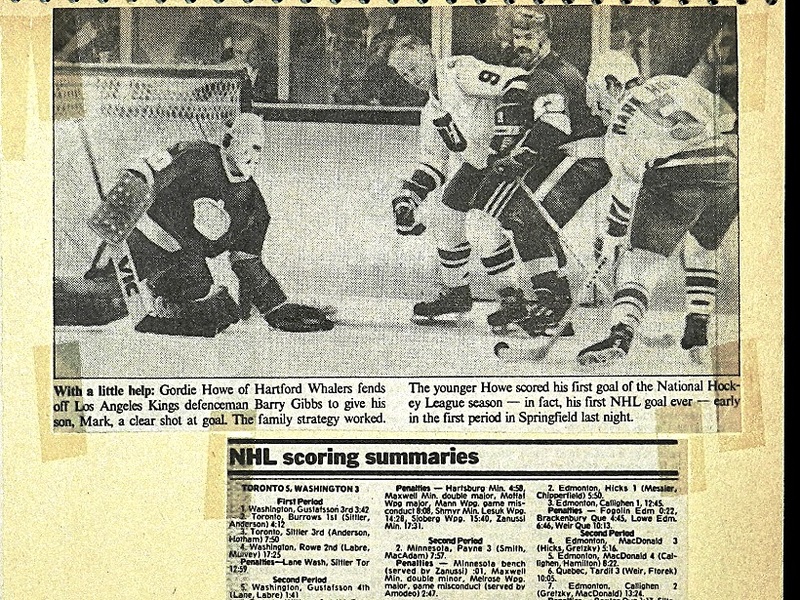 THE WHALERS, MAKING THEIR HOME DEBUT AT THE OLD SPRINGFIELD CIVIC CENTER, BEAT LOS ANGELES, 6–3. 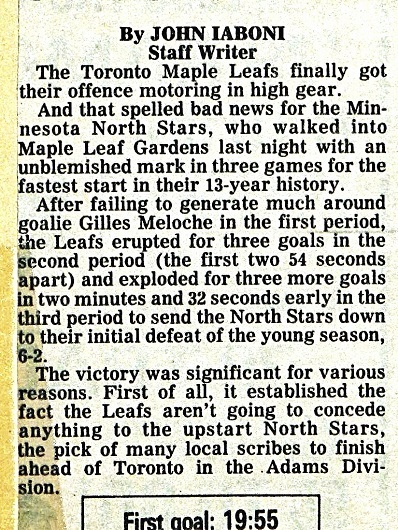 JUST 91 SECONDS AFTER THE OPENING FACE–OFF, FUTURE HALL–OF–FAMER MARK HOWE SCORED HIS FIRST OF 197 NHL GOALS (ON NETMINDER RON GRAHAME). THE WHALERS WOULD PLAY THEIR FIRST 22 GAMES IN NEARBY SPRINGFIELD WHILE THE HARTFORD CIVIC CENTER WAS BEING RE–BUILT. ITS ROOF HAD COLLAPSED UNDER TONS OF SNOW IN MARCH 1978, JUST HOURS AFTER A COLLEGE BASKETBALL GAME. 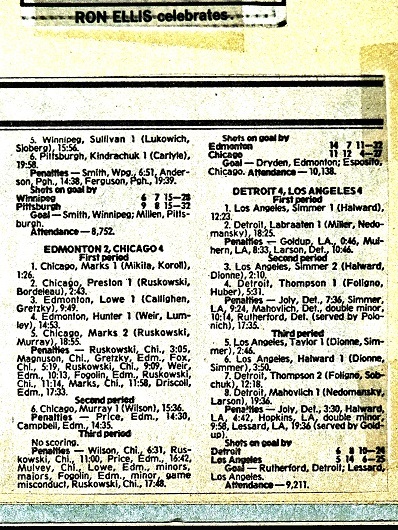 COINCIDENTALLY, THE FIRST NHL MATCH AT THE RE–STRUCTURED ARENA (FEB. 6, 1980) WAS ALSO AGAINST LOS ANGELES. HARTFORD PREVAILED, 7–3. 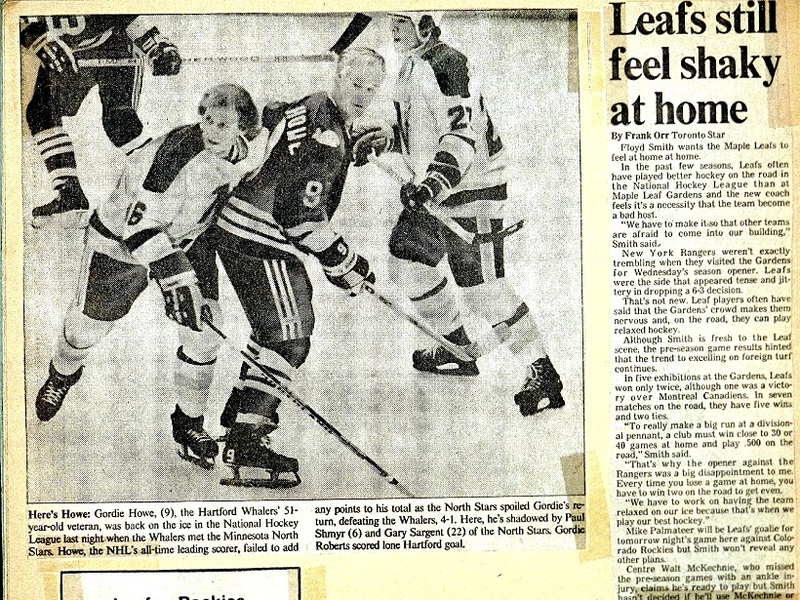 GORDIE HOWE AND MARK HOWE IN THE WHALERS FIRST NHL HOME GAME. 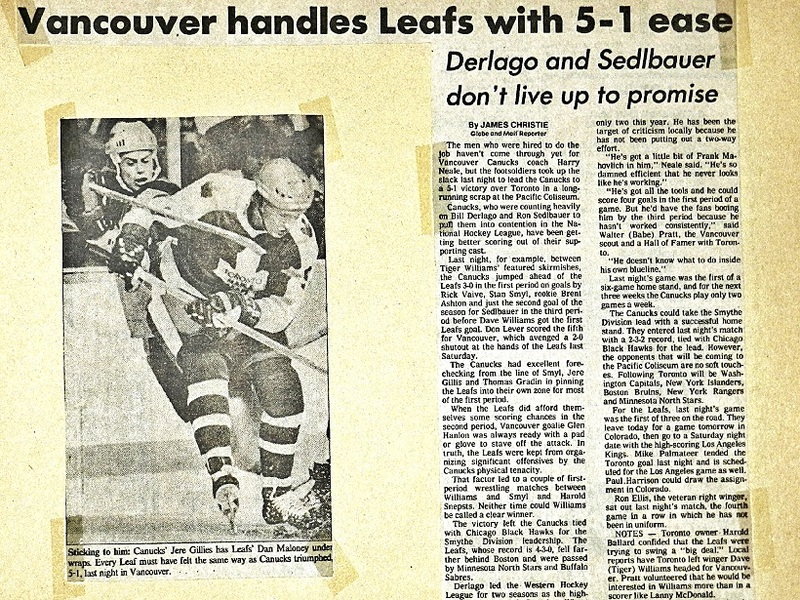 ON SATURDAY, OCT. 20, 1979, THE VANCOUVER CANUCKS CAME TO MAPLE LEAF GARDENS WEARING THOSE HIDEOUS BLACK ROAD JERSEYS WITH THE GOLD AND ORANGE ‘V’ ON THE FRONT. 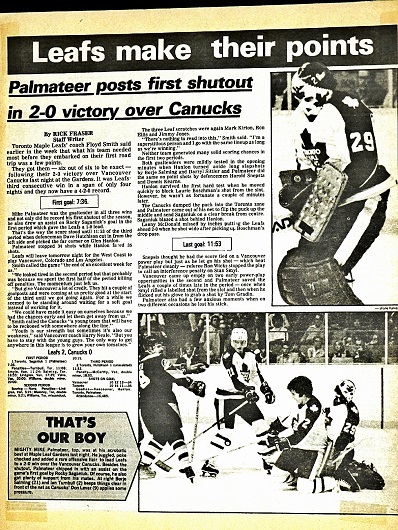 MIKE PALMATEER RECORDED THE SHUTOUT IN A 2–0 TORONTO VICTORY. THE OILERS GAMES OF OCT. 21 (AT HOME TO MINNESOTA) AND OCT. 23 (AT NEW YORK ISLANDERS). 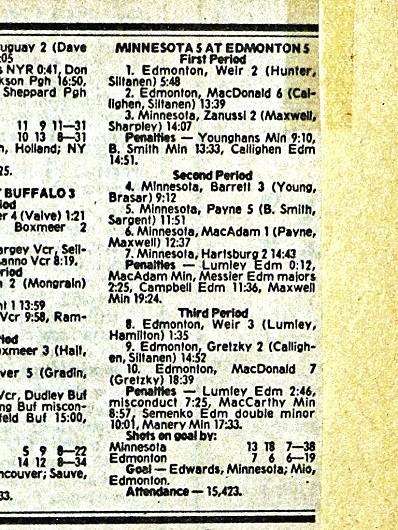 WAYNE GRETZKY SCORED HIS SECOND NHL GOAL IN THE TIE AT NORTHLANDS COLISEUM. 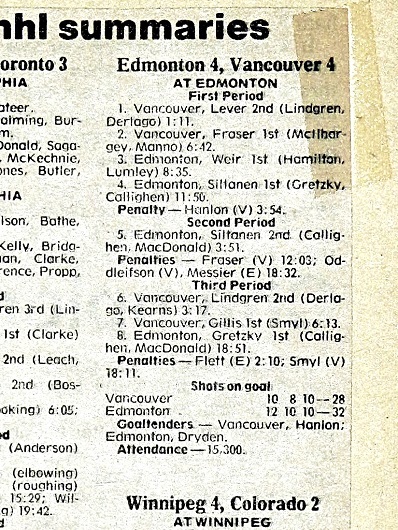 HE HAD AN ASSIST AT NASSAU COLISEUM, AS EDMONTON BEGAN ITS FIRST EASTERN ROAD SWING WITH ANOTHER DRAW. BILLY HARRIS SCORED THE TYING GOAL ON EDDIE MIO WITH 1:17 LEFT TO PLAY. OCT. 24, 1979 (A WEDNESDAY). 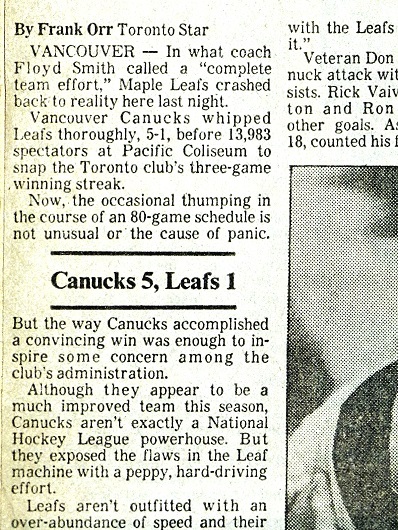 THE MAPLE LEAFS BEGAN THEIR FIRST WESTERN TRIP OF THE SEASON BY GETTING PUMMELED AT THE PACIFIC COLISEUM IN VANCOUVER. 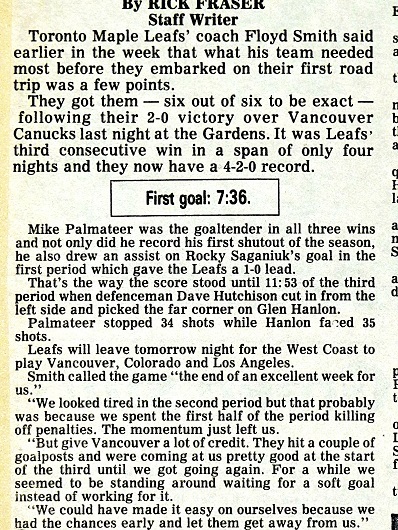 ROOKIE WINGER RICK VAIVE OPENED THE SCORING FOR VANCOUVER, BEATING MIKE PALMATEER AT 2:07 OF THE FIRST PERIOD. 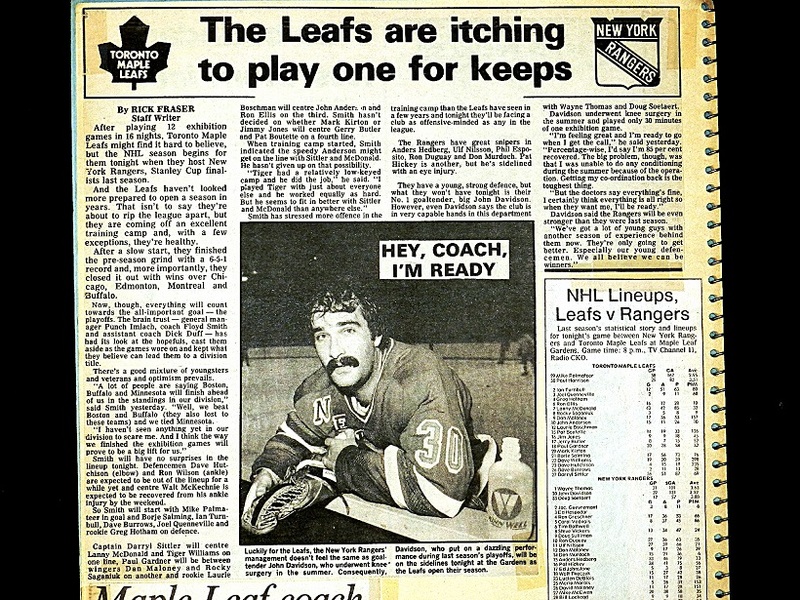 DAVE (TIGER) WILLIAMS SCORED THE LEAFS ONLY GOAL, IN THE THIRD. 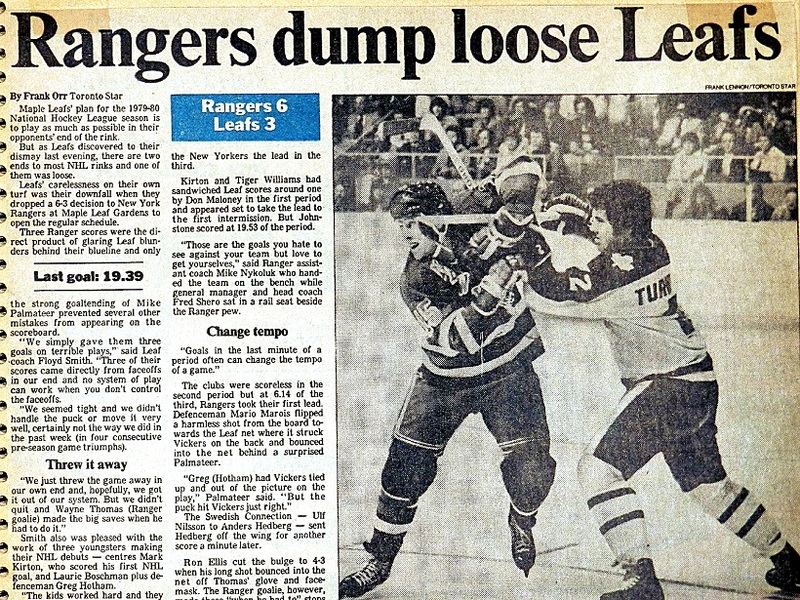 ON FEB. 18, 1980, VAIVE AND WILLIAMS WOULD BE EXCHANGED FOR ONE ANOTHER IN THE ONLY GOOD TRADE OF PUNCH IMLACH’S DISASTROUS SECOND–COMING IN TORONTO. 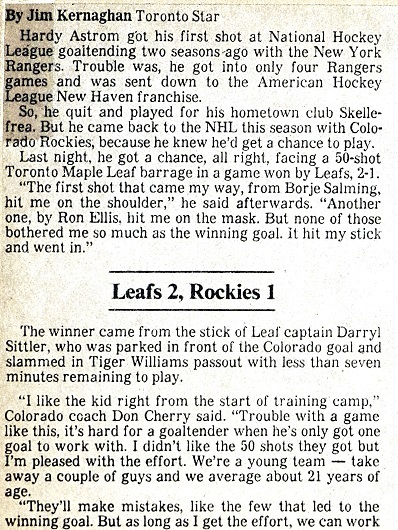 BILL DERLAGO ALSO WENT TO THE LEAFS; JERRY BUTLER TO THE CANUCKS. 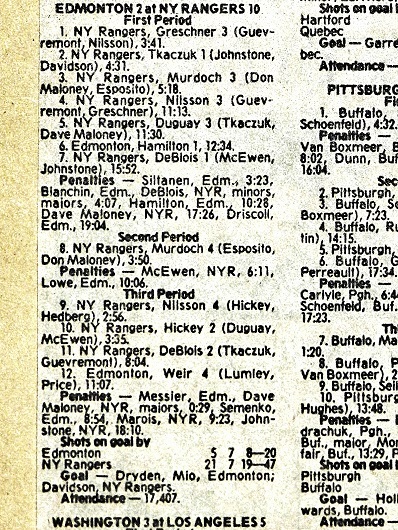 MEANTIME, THE OILERS GOT BLASTED, 10–2, BY THE RANGERS AT MADISON SQUARE GARDEN IN THEIR SEVENTH NHL GAME. WAYNE GRETZKY DID NOT RECORD A POINT. HALL–OF–FAMER PHIL ESPOSITO HAD TWO ASSISTS FOR NEW YORK. 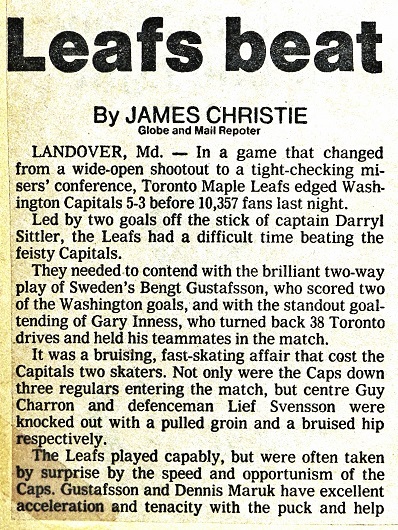 THE LEAFS VISITED DON CHERRY AND THE COLORADO ROCKIES ON A FRIDAY NIGHT (OCT. 26, 1979). IN A FREE–FOR–ALL AT OLD McNICHOLS ARENA, THE TEAMS COMBINED FOR 85 SHOTS–ON–GOAL IN A 2–2 DRAW. 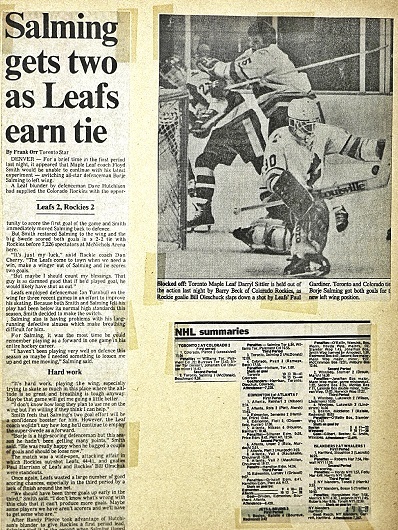 PAUL HARRISON OF THE LEAFS AND BILL OLESCHUK OF THE ROCKIES SHONE BETWEEN THE PIPES. NELSON PYATT BEAT HARRISON FOR THE TYING GOAL (SUMMARY BELOW) WITH 2:05 LEFT ON THE CLOCK. FUTURE LEAFS CAPTAIN ROB RAMAGE ASSISTED ON THE PLAY. 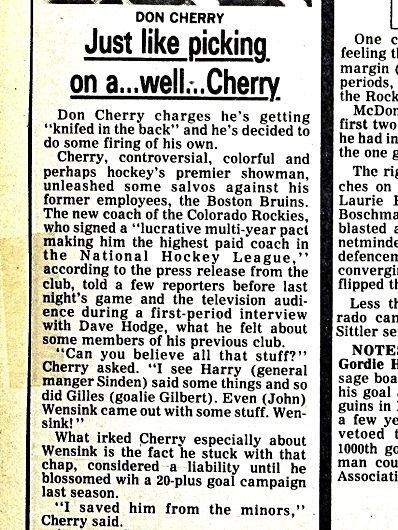 DON CHERRY WAS FEATURED IN JIM CHRISTIE’S GLOBE AND MAIL GAME STORY FROM DENVER. 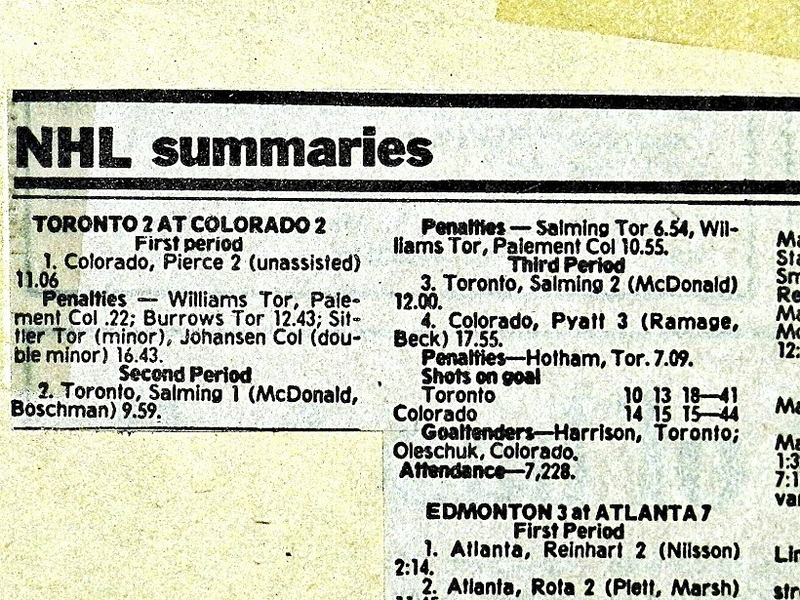 IN THEIR EIGHTH NHL GAME (ALSO OCT. 26, 1979), THE OILERS GOT POUNDED ONCE MORE — THIS TIME AT THE OMNI IN ATLANTA. WAYNE GRETZKY WAS AGAIN HELD SCORELESS. ERIC VAIL SCORED TWICE FOR THE FLAMES. THE FOLLOWING DAY CAME DREADFUL NEWS FROM TORONTO AS JOHN McLELLAN DIED OF A HEART ATTACK MINUTES AFTER WORKING IN HIS GARDEN. 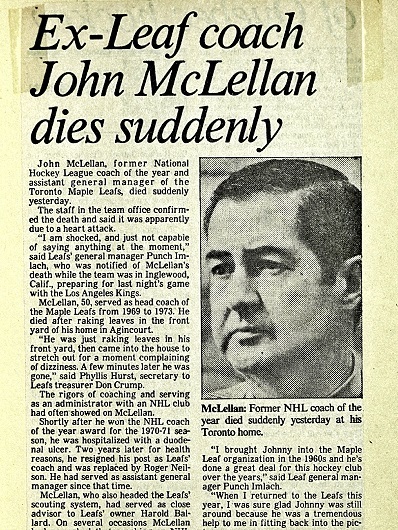 McLELLAN HAD REPLACED PUNCH IMLACH AS COACH OF THE LEAFS IN 1969–70 AND STOOD BEHIND THE BENCH FOR FOUR SEASONS. AT THE TIME OF HIS DEATH, HE WAS A TRUSTED ASSISTANT TO IMLACH, THE GM.